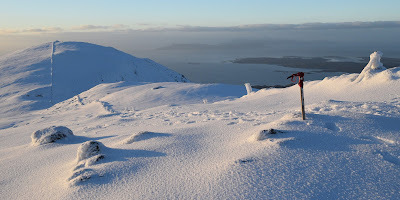 Climb Rois Bheinn on a fine winter day and you will probably be able to work out where it is. Rois Bheinn (pron. Roshven) is a Corbett in one of Scotland's most under-appreciated areas. Not Skye, whose hotspots are apparently overrun by tourists, or the North Coast 500, whose success means some tortuous roads in the north-west will have to be upgraded. This is Moidart, part of a 45 by 30 mile lozenge of land south of the A830 still only lightly touched by tourism or outdoorsy types. 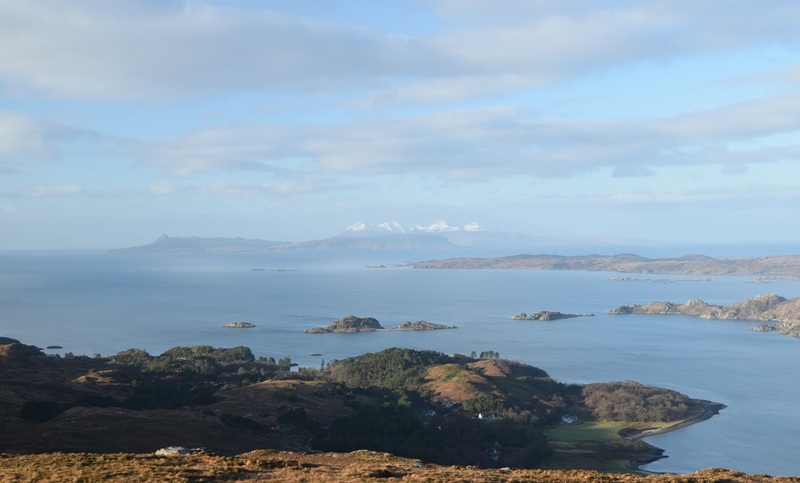 Heaven requires a bit of work: there's hoof-churned fields to wade through first (reminiscent of Gigha's Isle of Mud) and a relentless climb up steep, tussocky ground. These bogs are hard going in descent, especially if you've stayed up high for sunset and are coming down in the dark. Seasoned hillwalkers are used to this: it's the price you pay for getting the good stuff. The figure in the photo below was taking pictures of the sunset. He was disappointed because the views weren't as good as he hoped. Apparently if the north-west hadn't clouded over an hour before sunset it would be even better. He thought this was shite. But for us it was a little slice of heaven, carved out of a sunny winter's day. Did the unimpressed figure have an Alpine resort in his ruck sack?